As you may have heard, Etsy has implemented a fee hike for sellers. The TL;DR version is this: Etsy increased its per-transaction fee on all sales from 3.5 percent to five percent and will use that revenue to expand its marketing. It is also applying this fee to shipping costs, allegedly to discourage sellers from engaging in shady pricing tactics, i.e., under-pricing their goods to reduce the fee and over-charging on postage to make up the difference. The hike went into effect on July 16, which is also when our new prices went into effect — a decision we did not come to lightly. We’ve not raised our prices once in our seven-plus years on Etsy, even though the cost of materials and shipping had gone up quite a bit during that time period, so honestly, it was past due and this seemed like as good a time as any to address the issue. For all catalog items in the $7 to $10 range, the increase is 50 cents and for items in the $11 to $15 range, the increase is 75 cents, and this covers the majority of our products. We plan to keep the cost of First Class postage as-is. Our base price still covers the cost to us in postage, as well as the envelopes, baggies, and business cards we use when filling orders, so there’s no need to bump that up, even with the fee hike. Priority Shipping, however, will be increased a little to offset the fee. Thank you for your understanding, and we hope to continue doing business with you for many years to come. As you may have heard, Etsy is planning to implement a fee hike for sellers. The TL;DR version is this: Etsy is increasing its per-transaction fee on all sales from 3.5 percent to five percent and will use that revenue to expand its marketing. It is also applying this fee to shipping costs, allegedly to discourage sellers from engaging in shady pricing tactics, i.e., under-pricing their goods to reduce the fee and over-charging on postage to make up the difference. The hike is scheduled to go into effect on July 16, and unless buyers and sellers can pressure Etsy into dropping this plan — say, by hitting its Facebook and Twitter accounts to lodge a protest (using #etsyfees) — this is going to cause Etsy sellers to increase their own prices or even close their shops. In considering our own course of action, we looked at our seven-plus years on Etsy and realized that in all that time we hadn’t once increased our prices, even though the cost of materials and shipping had gone up quite a bit during that time period. So we are going to be looking at our entire catalog and will be implementing nominal increases across the board, both to account for the increase in material costs to us and to counteract the fee increase. Our goal is to keep these increases minimal so as not to adversely impact our customers. A patch that currently costs $7, for example, will go up to $7.50. We want our customers to know we did not come to the decision lightly. We considered keeping everything as-is pricewise, but the numbers simply did not work in our favor. You have until July 16 to buy from us on Etsy before prices start going up, or you can go to our webstore, where we plan to keep prices as they are. When we decided back in 2016 to stop doing conventions and went to an online-only business model, we noticed that interest in our embroidered accessories — scarves, neckties, and bags — dropped significantly, but interest in our core product line, our patches, remained strong. 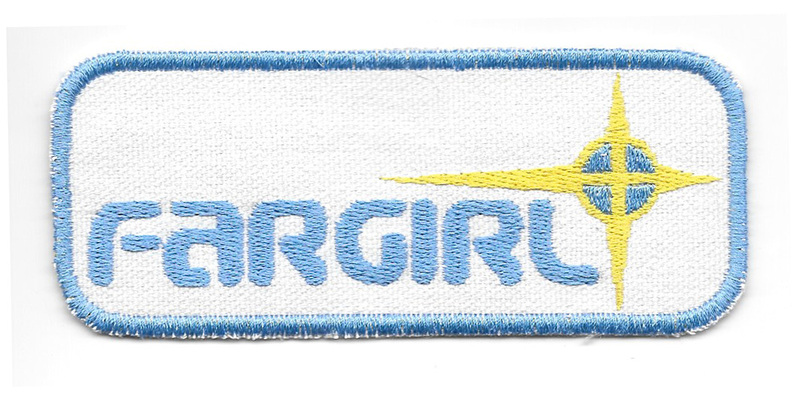 After some brainstorming, we made the decision late last year to discontinue our accessories line to focus on patches. We made this decision reluctantly because we like our bag designs and hated to see them disappear from our catalog — which led us to “re-imagine” them, as they say in Hollywood. Over the coming weeks and months, we’re rolling out a new line of large-scale patches based on some of our most popular bag designs, which means you can customize a bag you already own! 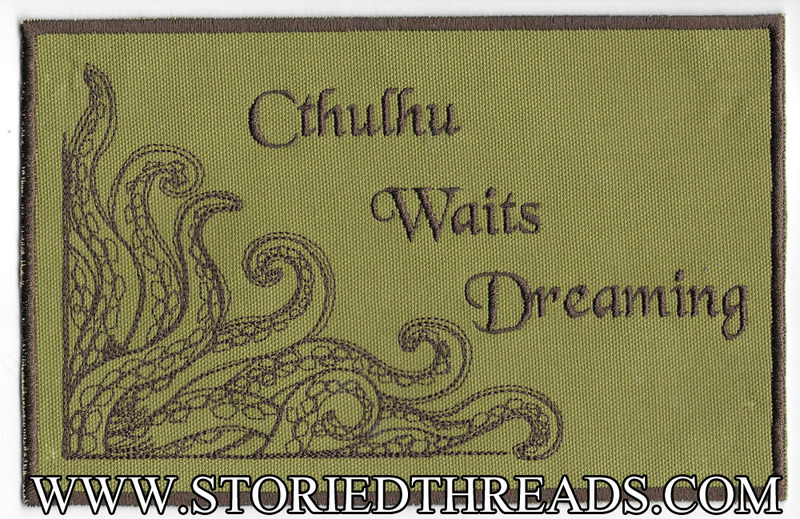 The first design in this new line is our Cthulhu Waits Dreaming patch, depicting the Elder God’s facial tentacles reaching out, as if to snare some poor human who stumbled onto fabled R’lyeh. The image and text are embroidered in dark brown on an olive drab fabric and measures 8.85 inches by 5.67 inches — the perfect size for a laptop bag or the back of a jacket! You can buy it now for $13 (plus shipping) at our web store or our Etsy shop! Well, as some of you may know, my husband Michael is an independent author, and his main series is the YA superhero adventure Action Figures. He recently released the seventh book in the series, The Black End War, and his editor Julie was so enamored with a particular element of the story (I don’t want to say too much because I don’t want to spoil it for you!) 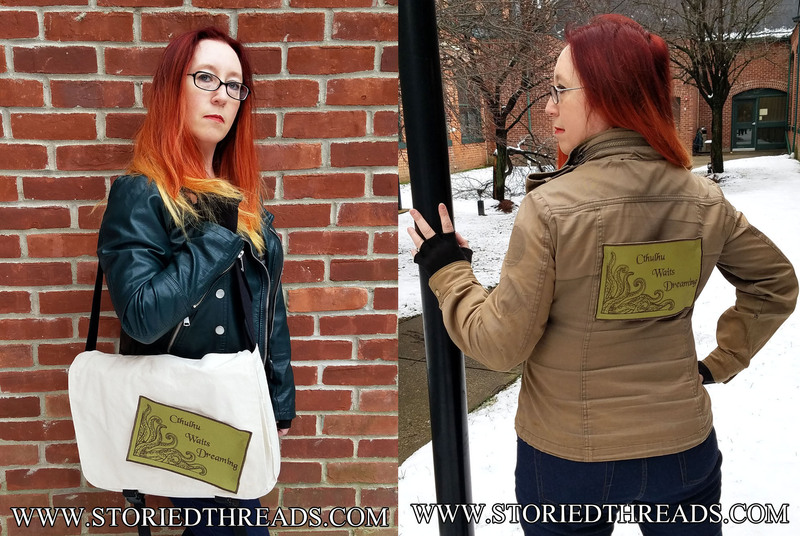 she commissioned a special patch inspired by the book. I’m now making the patch available to Action Figures fans and the general public, and you can grab one now for $7 at either my web store or my Etsy shop. What this? A new item? After all this time? Yes, I know it’s been a long whole since we unveiled a new addition to our patch line, so to make up for it we’re going big by unveiling a new design by our friend Marrus: the Clover Fae Twins! It took us a while to get the design just right so it met with Marrus’s approval, but we’re happy to report it was worth the time and effort, because Marrus has given it her very enthusiastic seal of approval. 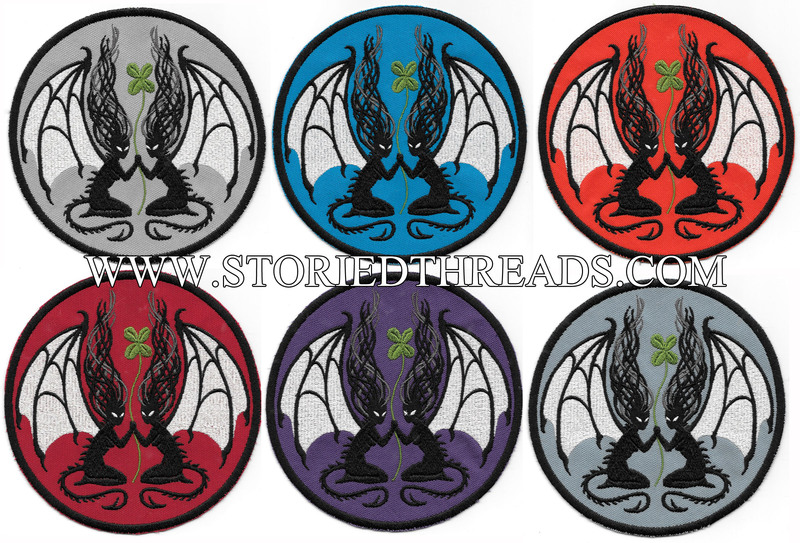 As with the other designs in the Demon Fae line, the Clover Fae Twins are available on your choice of six background colors: red, orange, light blue, teal, purple, and light gray. Own this piece of fabric art, suitable for framing, for $32. Happy Holidays from Storied Threads! It took a lot of overtime on our part, but we finally managed to clear our production queue in time for holiday delivery. Now that we’ve got a blank slate it’s time to…well, let it back up again. As of noon today, Storied Threads will be closing up the studio until after the New Year. We will continue to check and respond to messages, and we will endeavor to deliver any in-stock items we have as quickly as possible, but we will not be filling any made-to-order items until January 2, 2018. Thank you for a great 2017 and we’ll see you next year! Storied Threads – Back Open For Business! As you may recall, we placed our Etsy shops on hiatus to allow us to catch up on a backlog of orders — a backlog that was badly exacerbated by the loss of one of our two machines due to mechanical issues. We’re happy to announce that, after an intensive weekend of filling orders, the Etsy shops will be opening back up today and we will start accepting orders again. Thank you for your patience and understanding during this rather stressful time. However, we’d like to take this opportunity to let everyone know that even though we are accepting orders again, we are unable to fill any orders in time for Christmas. At this point, we wouldn’t be able to fill any new orders until Thursday, December 21, which means they would not arrive by Saturday, December 23. We do have a very small selection of in-stock items ready to ship, so feel free to contact us at veronica@storiedthreads.com and ask about a particular item. We can ship in-stock items same day, but you would need to pay for Priority or Priority Express shipping to guarantee delivery by the weekend. One last note: as we head into 2018, we will be trimming our catalog further to eliminate our selection of accessories — namely the bags, scarves, and neckties. Since we stopped doing shows following the 2016 season, activity in those areas has fallen off sharply, so we’ve decided to clear out the clutter and formally discontinue them as regular catalog items. As part of this project, we will be going through our on-hand stock and marking items down for expedited sale. Stay tuned!